The term “heterochromia” usually refers to the condition of having two different eye colors. The word is derived from the Greek words ‘heteros’ and ‘chroma’ which together implies “different color”. However, this definition is not only limited to eye colors but it also describes the differences in other areas such as hair and skin. The rarity of the condition results to the lack of specific data when it comes to the number affected around the world. There is an estimation that only 1% possess this globally. The other terms used to describe define the heterochromia of the eyes are heterochromia iridis and heterochromia iridium. Both iridis and iridium are Latin for iris. People who have heterochromia are referred to as those whose irises have an abundance or lack of melanin in one eye as compared to the other. The concentration of melanin is not equal; thus, giving the person what others might call an “exotic” look. The term can also be used to describe people who have one iris that has two different colors. Humans are not the only ones who have this kind of condition. Heterochromia is also seen in dogs and cats. Some breeds of cats such as Turkish Angora and Japanese Bobtail have complete heterochromia. This means that their eye colors will be completely different from each other. Though heterochromia might be easily mistaken as an eye disease, it is in fact benign. The condition doesn’t have a negative effect on the strength of one’s vision and genetically, it is not associated with other health problems. However, it is proposed for one to have an eye checkup once the person feels any kind of irritation. In ancient times, those who have heterochromia were regarded with a mysterious, other-worldly air. At present, both human beings and animals are lauded for this unique, mesmerizing quality. Popular figures like Mila Kunis, Jane Seymour, and Alice Eve possess this unique characteristic. In some cases, there is a confusion between heterochromia and iris nevus. The main difference between the two is that the nevus is usually color brown and the shape is round. It might be inferred that the nevus with a brown color contained in a differently-colored iris is under the division of partial heterochromia but the nevus as a cause is completely dissociated from heterochromia. Iris nevus can be malignant and a visit to the doctor is advised to monitor any growth. Two totally different eye colors characterize people who have complete heterochromia. This is very striking and apparent. There might be an abundance of melanin in one eye and a complete lack of it in the other. Many animals are also known to possess this. Based from the term itself, this type of heterochromia refers to the inner (or central) iris having a different color from the outer. An example is a blue center with a gold outer color or border. This is where the term ‘cat eyes’ is derived. The border color is known to be the real eye color. Known as the rarest type of heterochromia, the peripheral heterochromia is characterized by a concentrated patch of color in a major area or smaller ones. This type doesn’t form an entire ring and this description is what differentiates it completely from the former one. This kind of heterochromia is the most widespread; hence, it is known that 1% have this globally. Hyperchromic iris pigmentation – The presence of gold-tan or brown Lisch nodules is a characteristic of this pigmentation. This is known to be associated to Neurofibromatosis and von Recklinghausen disease. 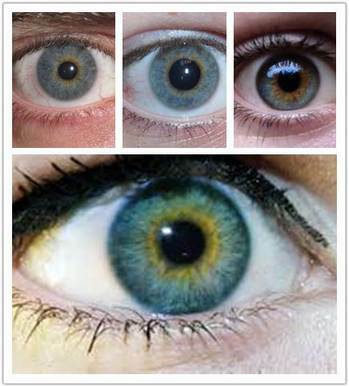 Hyper chromic iris pigmentation can occur as peripheral and in some cases, complete heterochromia. Neurofibromatosis on the other hand, is specifically connected to café-au-lait spots, axillary freckles and neurofibromas. Ocular melanosis/ melanocytosis (melanosis oculi) – This is classified under the peripheral or complete types because of the presence of pigmented lesions in the eye. Naevi, like the lesions can also be present in the uveal tract. Pigment dispersion syndrome (PDS) – This is a result of the disruption in the iris pigment epithelium (IPE). The dispersion of granules to the anterior segment (specifically that of the iris) follows this. There will be a deposit of pigments. The development of glaucoma is possible to those who have this. Sturge-Weber syndrome – A gene mutation (GNAQ gene) is episodic in the event of the Sturge-Weber syndrome. The resulting conditions are port-wine stain and ipsilateral leptomeningeal angiomas. Several ocular abnormalities such as glaucoma and iris heterochromia can also result from this. – Simple congenital Heterochromia – The iris heterochromia is evident and it is not characterized by ocular or systemic anomalies. – Congenital Horner’s syndrome – This occurs when there is an injury to the fetal brain or sympathetic nervous system that affects the eye. – Waardenburg syndrome – The Waardenburg syndrome types I and II are linked to the central or complete heterochromia. This is also associated with the peripheral heterochromia and the pattern of inheritance follows the autosomal dominance. – Piebaldism – This is the same as Waardenburg syndrome. The only difference is that those who have piebaldism are not deaf. – Hirschsprung’s disease – Compared to the others, this is a common congenital condition. The lack of ganglia cells in the gastrointestinal tract is due to the complication in the intestine. This is often connected to bowel disorder. – Chediak-Higash syndrome – Infection is a related issue to this autosomal recessive syndrome. People who have this not only have hypopigmentation of the eyes but also of the hair and eyes. This is under hyperchromic heterochromia. – Tuberous sclerosis – The other term for this syndrome is Bourneville disease and is characterized by benign tumors in several organs of the body which includes the eye. Incontinentia pigmenti – This is also known as the Bloch-Sulzberger syndrome. This not only affects the eye but also the central nervous system, teeth, and hair. Parry-Romberg syndrome – Another term for this is progressive hemifacial atrophy. It is often associated with the malformation of facial tissues. Siderosis bulbi – This cause is related to iron deposition. The deposit is caused intrusive force that inevitably results to the formation of foreign bodies which contain iron. Trauma – An eye injury can be the cause of the iris’ hyperchromicity. This can happen before the age of seven. Iris hyperchromia resulting from medication – Central heterochromia is a result of the introduction of Prostaglandin eye drops. Some examples of these are latanoprost, isopropyl unoprostone, and travoprost. These medicines are used for glaucoma treatment. The continuous use leads to the formation and abundance of melanin production. Neoplasm of the iris – Segmental hyper pigmentations as a characteristic of sectoral heterochromia are evident. Rubeosis Iridis – The presence of the neovascularization developed on the stroma of the iris is caused by the unusual growth of the blood vessels on the anterior surface. It is a common quality of patients who have diabetes. Iris ectropion – This condition can be under that of the central and peripheral heterochromia. There is a covering of the iris’ posterior pigment epithelium by the anterior surface. It is made possible through the pupillary surface. Inflammation of the iris – This is also called iritis/ anterior uveitis. Fuchs heterochromic iridocyclitis as a cause of the inflammation of the iris doesn’t display an evident ‘moth eaten’ appearance. Rather, the ocular symptoms are hardly discernible and only minimal. 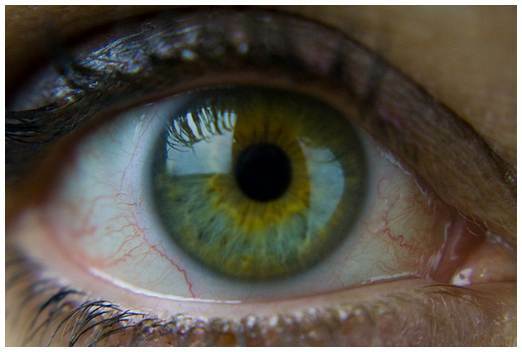 On the other hand, patents who have this depigmentation of the iris have a high risk of contracting glaucoma. Acquired Horner’s syndrome – As a congenital disease, there is a fewer frequency of occurrence compared to the others. This is present in both adults and children and is secondary to diseases like neuroblastoma, neurilemmoma, and cervical ganglioneuroma. Iris atrophy – Trauma is a cause of this condition. There is a decrease in the pigmentation of the iris. Another known cause is Iridocorneal endothelium (ICE). Others – Other rare syndromes include Duane syndrome (Chronic iritis, Juvenile xanthogranuloma, Leukaemia and lymphoma) & Posner-Schlossman syndrome/ glaucomatocyclitic crisis.